Brighten your Beautiful Smile… in an Hour! Zoom Teeth Whitening Los Angeles gives you something to really smile about. As the best cosmetic dentist Los Angeles can boast of, we bring you the amazing Zoom Whitening brand that has already beautified over 4 million smiles! You’re not alone if you are worried about less-than-white teeth hampering your smile. A set of beautiful white teeth can enhance your beauty and light your smile. Don’t let the lack of such teeth undermine your confidence. Whiter teeth and a beautiful smile can boost your confidence and self-esteem but unfortunately for most people they don’t know how to get it. Fortunately for you, you’re reading this so you can get those pearl white teeth and a beautiful smile very easily. Call (323) 936-9997 for an appointment. Click here to see how the Zoom teeth whitening procedure works. A whiter, brighter smile is easily possible through the proven technology of Zoom Whitening. Having beautified the smiles of over 4 million smiling people, this teeth whitening is the best bet for your smile being one in a million! The Zoom teeth whitening program has worked wonders for so many people already. And it can do the same for you. The procedure is carried out by our dental expert, the best Los Angeles cosmetic dentist around. Click here to learn more about the Zoom teeth whitening technology. According to the American Academy of Cosmetic Dentistry, the majority of people in the US relate white teeth with their accomplishments in their personal/love and professional/business lives. So whether it’s getting intimate with your mate or negotiating a business deal, having white teeth and a beautiful smile goes a long way, in the right direction! Zoom teeth whitening shows you how. At Zoom Teeth Whitening Los Angeles you can find the most reliable and affordable Zoom whitening Los Angeles can offer you. You can even get it from the comfort of your home in LA. Click here to check out our special teeth whitening deal. If you have decided you really want to move on and get amazing white teeth then you CAN do something. 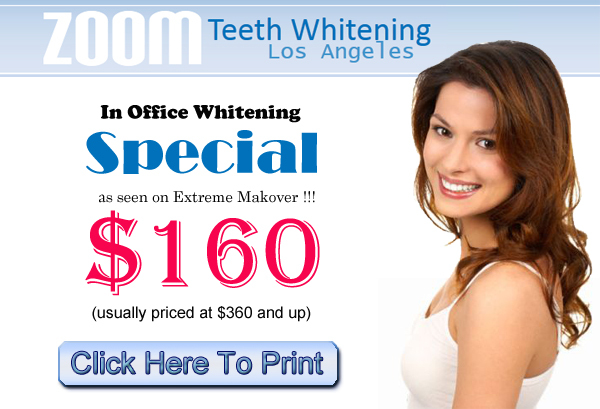 Call us at (323) 936-9997 right now to make an appointment for Zoom Teeth Whitening.